National Science Foundation ADVANCE Program Officer Kelly Mack welcomes participants. NPA Chair Stacy Gelhaus and participants listen to the first panel. Opening panel speaker Catherine Mavriplis, with (from left to right) Sibby Anderson-Thompkins, Elizabeth Freeland and Lilian Wu. Keynote speaker Kathie Olsen answers questions from the audience. "Data on Postdocs and Gender: What do We Know?" panelist Amber Budden, with (left to right) Jeri Mulrow and Cathee Johnson Phillips. "Why do Postdoc Women Leave the Academic Career Pipeline?" panelists (left to right) Diana Stavreva, Donna Ginther and Mary Ann Mason, with moderator Catherine Didion (far left). Phoebe Leboy participates in the discussion. 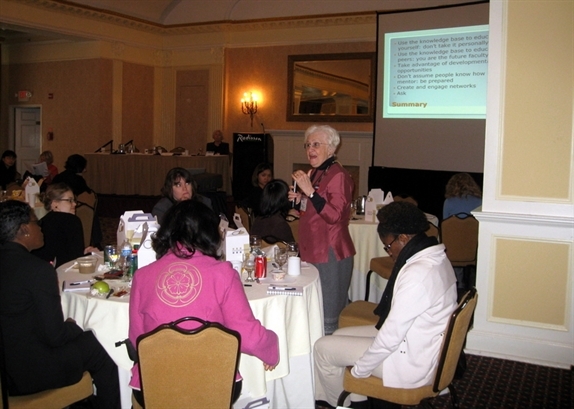 Participants develop recommendations during working lunch. Mentoring breakout session moderator, Leboy, with speakers Ginther, Dean and Lakoski (far right). Janet Bandows Koster presents during breakout session on Career and Professional Development. Postdoc policy breakout session speakers Roger Chalkley and Helen Mederer answer audience questions. Participants listen to breakout session speakers. Wrap-up session discussant Robert Tillman, Director of Faculty Professional Development at Columbia, with Lara Shamieh, Postdoctoral Scholar at the University of Washington. Photo credits: Kathleen Flint, except for working lunch photo, provided by Ju He. As part of NPA ADVANCE, the summit is supported by the National Science Foundation under Grant No. 0819994. Any opinions, findings, and conclusions or recommendations expressed in this material are those of the author(s) and do not necessarily reflect the views of the National Science Foundation.